Some times we can be grounded and not grounded all at the same time. A common way that defects happen in homes is they simply get done wrong from the get-go. 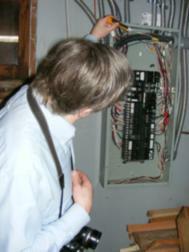 Improper installations that involve, clearances, types of materials and code violations are all common. Another way that defects happen is when repairs to existing, properly installed, components get done wrong----during the repairs. This is often the case in areas that involve multiple trades. For example Uncle Harry knows how to do plumbing----or at least good enough to make water run down hill and not leak---but does not fully understand electrical systems. Take for example, this outside faucet repair. One can see where the wall inside the garage has been opened up and new copper piping has been added, replacing the old galvanized pipe and non-frost free type faucet. While there are issues with attaching the copper to the galvanized pipe (electrolysis is possible due to the dissimilar metals), at least it was not leaking. To make this repair or upgrade of the faucet however, the house grounding electrode was disconnected. One can see the disconnected wire at the left of the pipe. The electrical system was still grounded via the ground rods driven near the meter, but this defect results in the incoming water pipe no longer being used as part of the grounding electrode system and also results in all the metal piping in the home being un-bonded to the electrical system. This is how we can be grounded and not grounded all at the same time. Without being overly technical, this condition creates a second pathway to ground. In the event of a ground fault and a person could become part of the pathway as the electricity was trying to figure out which way to go to ground. In other words----bad electrical juju. Obviously the ground wire needs to be properly reconnected to the water pipe by a licensed electrical contractor. Not a difficult fix----but certainly a life saving one. She loves me----she loves me not! Don’t you just HATE cats! We are going to: “Party-down”----in the basement! Forget Green----it is the next Ice Age! Why are there Monkeys and Rhinos in my Chimney?